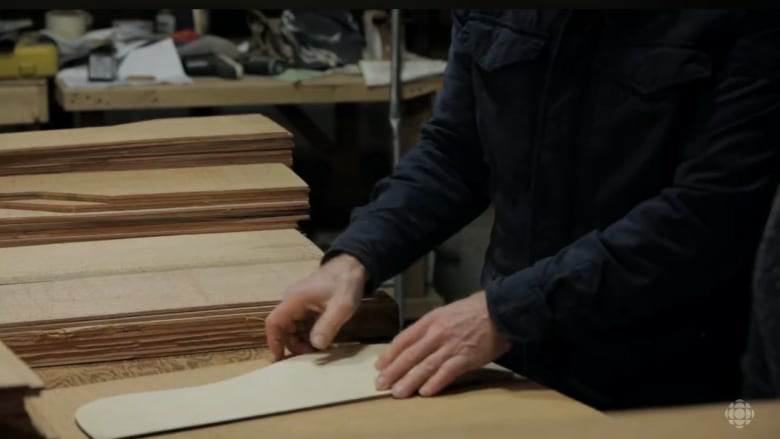 David Lapeyrouse runs Timbre Tonewood in Abbotsford, B.C., a mill and wholesale wood business that supplies tonewoods to instrument manufacturers, big and small. David Lapeyrouse has an ear tuned to the ring of a good piece of cedar, or a well-graded sheet of spruce. He runs Timbre Tonewood in Abbotsford, B.C., a mill and wholesale wood business that supplies tonewoods to instrument manufacturers, big and small. His biggest clients are in China where guitar-making has blossomed in recent years, and by David's reckoning, B.C. supplies the majority of the world's guitar-tops to the global market. "We deal with some of the finest wood in the world; it grows here," Lapeyrouse told CBC North By Northwest's Sheryl McKay. The company deals with four local species of trees exclusively, red cedar, engelmann spruce, sitka spruce and big leaf maple. "Every piece of wood is unique. They're like snowflakes," Lapeyrouse said, and explained that the maple is used for the back and sides of guitars and spruce is generally used for the top. "If you tap it, it rings. That's a characteristic of tonewood. it'll actually ring when you tap it." The old growth spruce and cedar that his customers need are a diminishing resource, so their value is on the rise. "Cutting this wood is kind of like diamond mining. There's different grades of diamonds. It's very rare. It's very valuable," he said. Wood from his mill has ended up on the benches of luthiers like Boucher Guitars in Quebec, a company that has produced instruments for the likes of Bruce Cockburn.